// Between the lines //: Am I an idiot? Since I saw this picture this afternoon in my reader (via Sewing Craftgossip) I have been feeling slightly upset and miserable. Really: I couldn't believe my eyes. I was yelling at my screen. 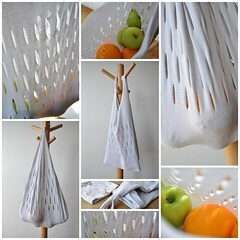 Did my Quick Fix Grocery Bag become an Eco-chic Shopping Bag without me knowing? I'm not sure what to think of this. Should I give this the benefit of doubt and just consider it a coincidence or are there too many similarities for this to be even possible and has someone at Good Housekeeping who was short of ideas and looking against a deadline simply copied my idea? This particular tutorial is one I am really proud of. The idea is genuinely mine - it happened while I was putting away grapes we had earlier that day and I saw the bag they came in lying on the counter - a plastic bag with cuts. This particular tutorial has been a big hit in the craft community ever since it was published and it still is, with referrals and links showing up everywhere. This particular tutorial made it even to Design*Sponge. And now, apparently, to Good Housekeeping too, only did they forget to credit or put up a proper link! It makes me wonder if I'm an idiot and incredible naive by posting tutorials and pictures of things I made just like that, for free, accessible to everyone, everywhere, assuming - or, as of now, hoping - everyone will stick to the rules when it comes to copyright and intellectual property rights. It also makes me wonder whether I should continue doing so the way I do. You see, there goes a lot of time and effort in everything I make, in every tutorial I write. I know, that's a personal choice - no one ever forced or even asked me to do so. All of this was a choice. Comments are closed now - Good Housekeeping has acknowledged its mistake and credits and a link to the original post have been added. Thank you for your comments, e-mails and support!